We confess that we were planning Kasen’s second birthday party since last year. We enjoyed the first party so much, we couldn’t wait to start dreaming up fun themes for a big ole Two Year Old. So, back to the drawing board… and by “drawing board” we mean “Google.” We just did a quick search for what other celebrities share Kasen’s birthday. Staring back at us? Bob Barker. And so the Price is Right party was born. Sorry for the iPhone picture instead of something with more quality – our cameras missed most of the action of Kasen’s birthday, so you’ll see a bunch of iPhone pics in this post. Better than nothing! We constructed toddler-height podiums using a cardboard and paint. We had a big box left over from Kasen’s new fish tank light. We cut it in half and spray painted it gold. Then we took another box and painted each quarter a different color. We used black duct tape to connect everything together and added vinyl numbering to represent each kid’s bid. We stuck some buzzers behind the podiums and viola! instant toddler fun. Before Drew Carey took over the show, Bob Barker used to stand on the stage looking over the audience and the contestants at the bidding podiums. We had the same set up. We constructed a stage using a piece of plywood on 4 small cinder blocks, which we had around the house. We put some batting on top of it (the same kind you use for quilting, etc.) to soften it for the kids, threw a white sheet over it, and called it a stage. We created a nice backdrop with a removable wall sticker that said “Price is Right” and set up some “prizes” for the “contestants” to bid on The “prizes” were actually Kasen’s big birthday present – a play table and chairs. A microphone completed the ensemble. Another toddler success! Framed out the pegboard, so the plinko pucks didn’t fall off the sides. 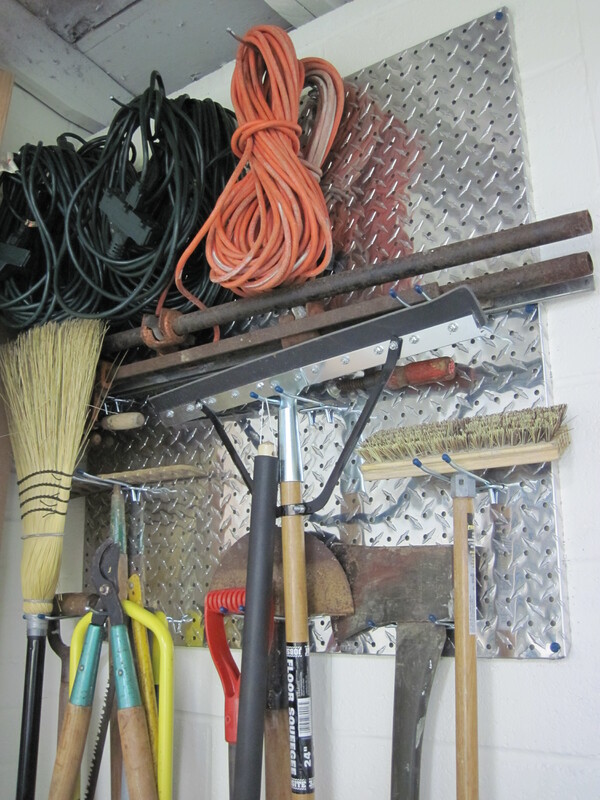 Added a couple small pieces of wood to create “goals” at the bottom of the pegboard. Installed the pegs at regular intervals. Cut Plinko pucks using the jig we had in the house for cutting door knobs. Added a couple of vertical legs to hold the pegboard up. Decorate! We painted the pucks rainbow colors and super-glued some scrapbooking letters on the top of the page. It was a hit. 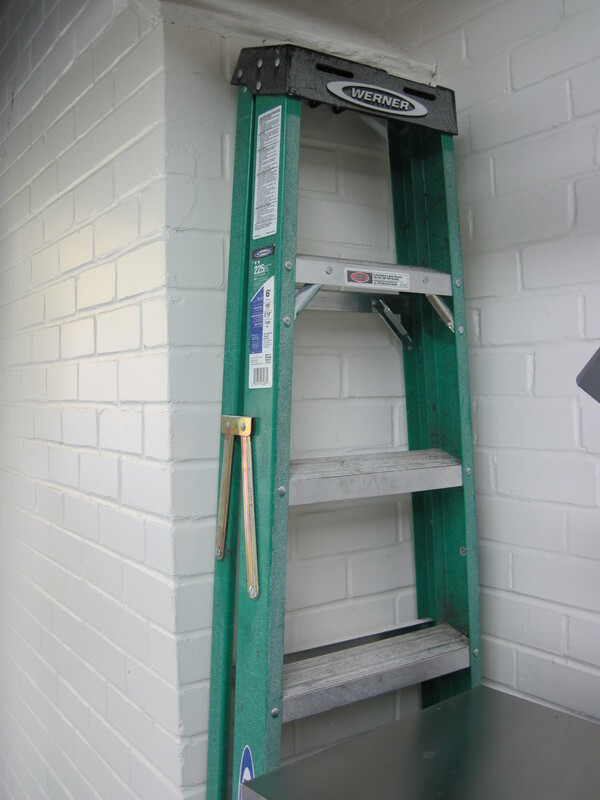 The kids loved climbing up Kasen’s ladder and dropping the pucks in the top. At the very end of the game, two contestants compete to win the biggest prize of the day, known as the Showcase. One player bids on a big prize that often includes vacations, cars, boats, or furniture. A second player bids on a different big prize. The player who bids closest to the actual value of their showcase wins the prize. The toddlers loved the new toys and games. Everyone had a great time, especially Kasen! We were really pleased with how everything turned out. We know that next year Kasen will probably have his own opinions about his birthday party, but we enjoyed planning a really fun and unusual party this year. We hope that you were inspired to throw an unusual party too! For a while when Kasen was starting to learn about colors, when asked “What color is this?” he responded “Yellow!” regardless of the object’s actual color. We are pretty sure that this declaration was a result of the word “Yellow” being fun and easy to say, because the true color-love-of-his-life is orange. He wants to eat out of an orange bowl with an orange fork, to wear an orange jacket, and to play with an orange ball. So, for his birthday , how could we not indulge him with some orange and yellow? That’s right! Kasen is the now proud owner of some orange fish. And they are happy fish. The fishtank is behind us on the left side of the picture (obviously the fishtank was not the focus of the picture). On a non-DIY note, Kristin recalls that her arms were only that buff becasuse she helped carry that fishtank (with some of the water and fish inside) in and out of the dorm every semester. Ah, to have those arms again. Wow, we really have changed over the years! The tank has been sitting in our basement gathering dust for a few years now. Since Kasen loves fish (and Krister wants a bigger, that’s right folks – BIGGER – tank), we decided to move it into Kasen’s room. Kristin’s brother Billy helped Krister move the tank and decided that the fish would be the perfect birthday gift for his nephew. And he was right. Kasen loves the “fishies”! When he wakes up from naps, we hear him through the monitor advising the fish that they are orange. You know, in case they forgot. Oh, and for those of you interested in some of the physics at work here… a 50-gallon fish tank weighs in the realm of 450-500 pounds when it is full. So, if you’re planning to get one, you can’t just plop it on any old piece of furniture. We are the type who tend to overbuild things and Kasen’s built-ins are no exception. The built-ins were constructed with a number of extra supports so that the shelves are strong enough to hold the tank (and probably more). After Krister installed the tank, he drilled a hole into the built-ins so to run the wires and tubing. We placed one of the toy storage baskets in front of the outlet, so Kasen wasn’t tempted to pull on anything essential. A big thank you to Billy for the awesome orange birthday present for his almost-two-year-old nephew! And we’ll be back next week with the details on Kasen’s birthday party (spoiler: it’s a Price is Right themed party, featuring some awesome DIY projects) and more birthday presents. We have begun progress on Littler K’s room! We haven’t made much progress (hence this post’s title), but slow and steady wins the race, right? We tested a shade of light green paint on the wall (Pale Vista by Benjamin Moore) and we’re sold. Replace the moldings to match the ones we’ve been updating in the rest of the house. Paint the walls and pray that we don’t have another wallpaper situation! Bring in the furniture and accessories! We’ve taken out the mouldings and covered the ceiling. 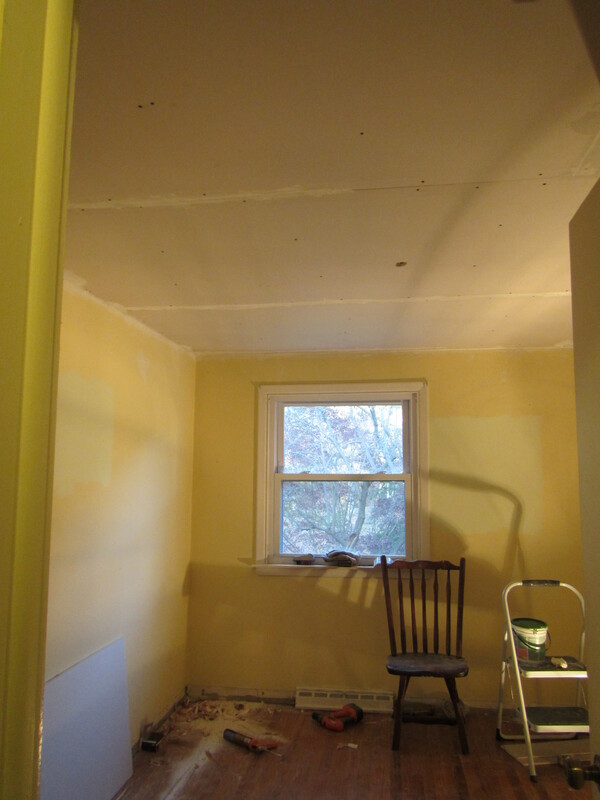 We are in progress for spackling and sanding before we paint the ceiling. Oh, and you can see our little paint sample on the wall next to the window (and another one on the left side of the picture). The color will pop more when we get some new lighting in there. So, we’ll continue to make baby steps. We won’t try and do anything too fast in light of the holidays – Happy Thanksgiving everyone! – and Kasen’s upcoming birthday (is he almost two already???). But we’ll keep chugging along and we’ll keep you posted along the way. Hope you all have a DIY holiday planned too. 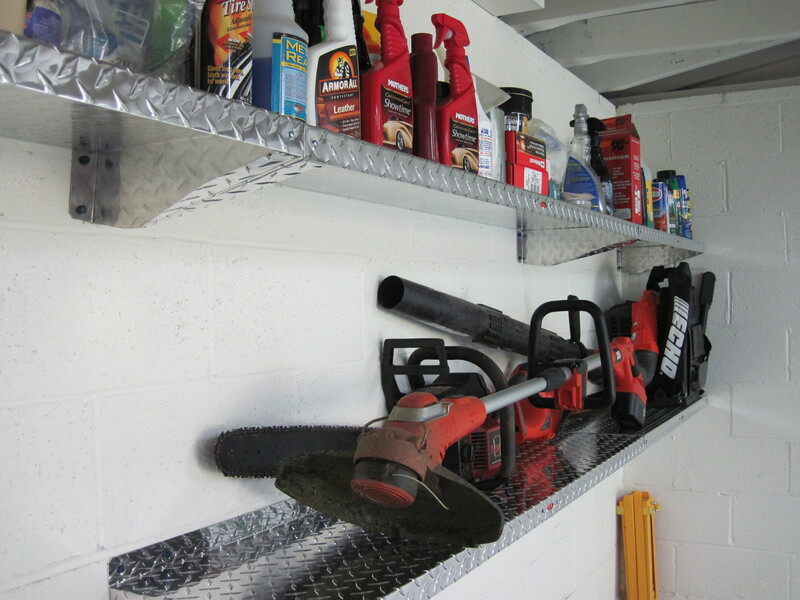 We installed shelves in the garage – woot woot. Diamond plate shelving doesn’t come cheap though. We found a great price on them at Sam’s Club and ordered them right away. 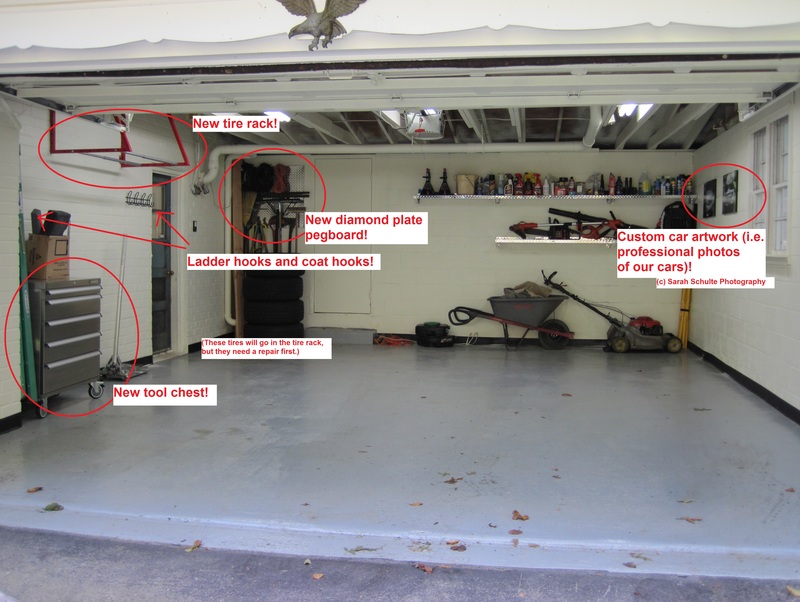 They cost about half what they cost at garage suppliers, so we were sold. The tool chest is eventually going to move to the space currently occupied by the wheelbarrow, whose permanent home will be somewhere else. 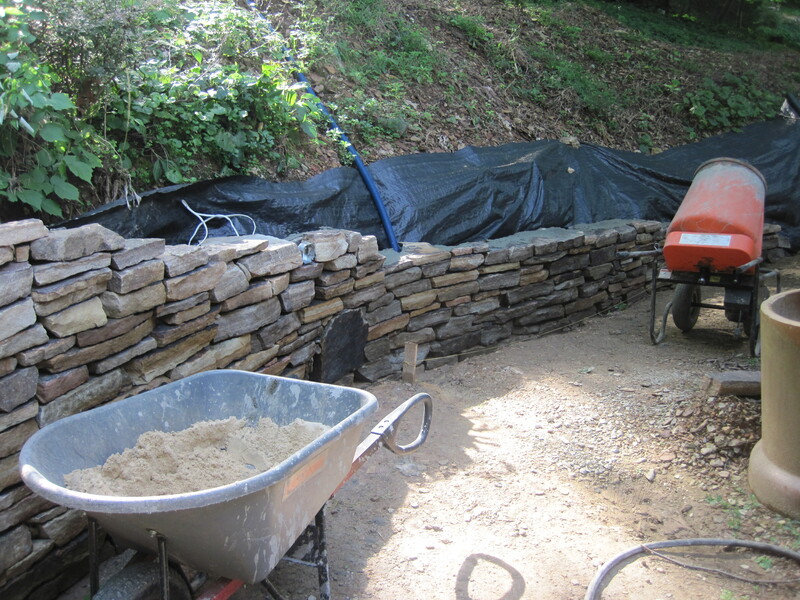 But currently, the wheelbarrow is full of weather-sensitive concrete mix for the wall, so it’s in the garage. Oh, and the coat hooks? They can hold a lot more than coats. Anchored into the brick, these puppies can literally hold a human. Trust us, we both gave it a try. The best part? Our basement doesn’t look like this anymore! Just in time too… we had a delivery of hand-me-down furniture arrive only a day or two after we finished installing the shelves. New furniture pics coming soon! We are approaching the pregnancy half-way mark. The baby is due in 21 weeks, and we are only 2 weeks from finding out the baby’s gender! We love that milestone – it makes the baby feel more like a future family member. 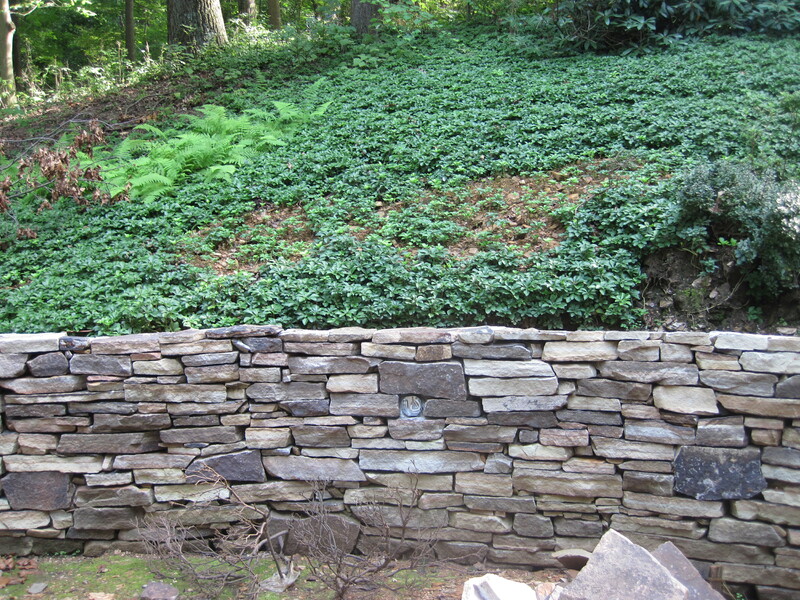 Little projects can turn into major renovations. 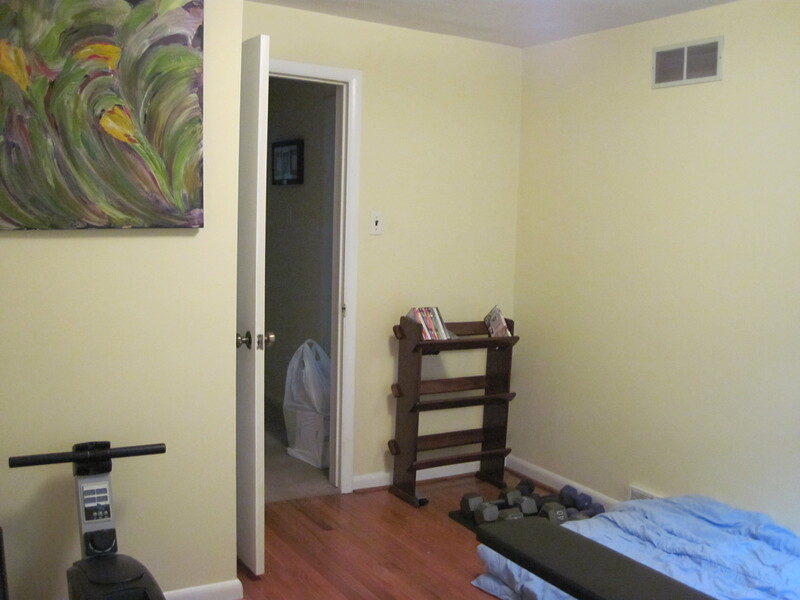 (It took us 8 weeks to paint Kasen’s room, thanks to the discovery of the painted-over wallpaper that bubbled up when the paint was applied.) This can be a problem when you have a firm deadline like the birth of a baby. Finish everything, Everything!, before the baby’s arrival. We planned to do Kasen’s built-in shelves after a few months… but we didn’t touch it until over a year later. 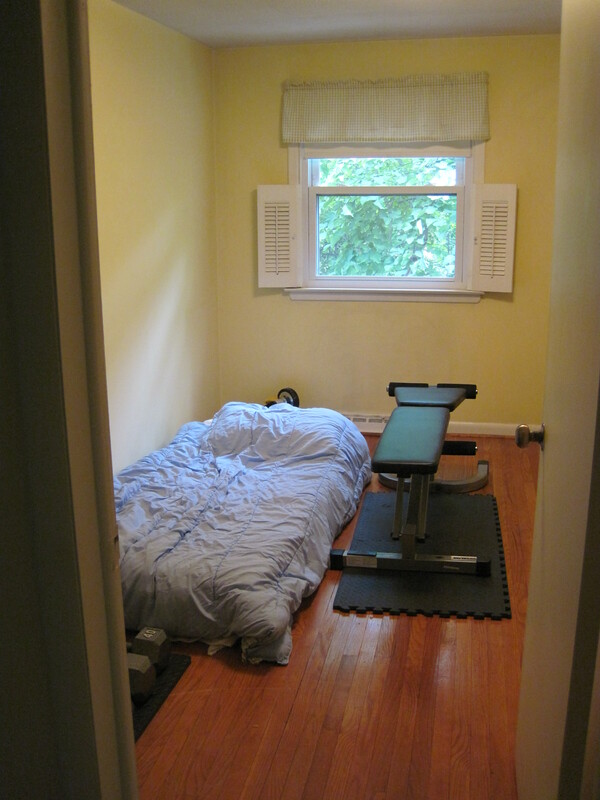 Admittedly, we still have some exposed screws and some moldings that were never installed in his room since he’s usually sleeping in there when we’re working. Next, we measured out the room and started space planning. 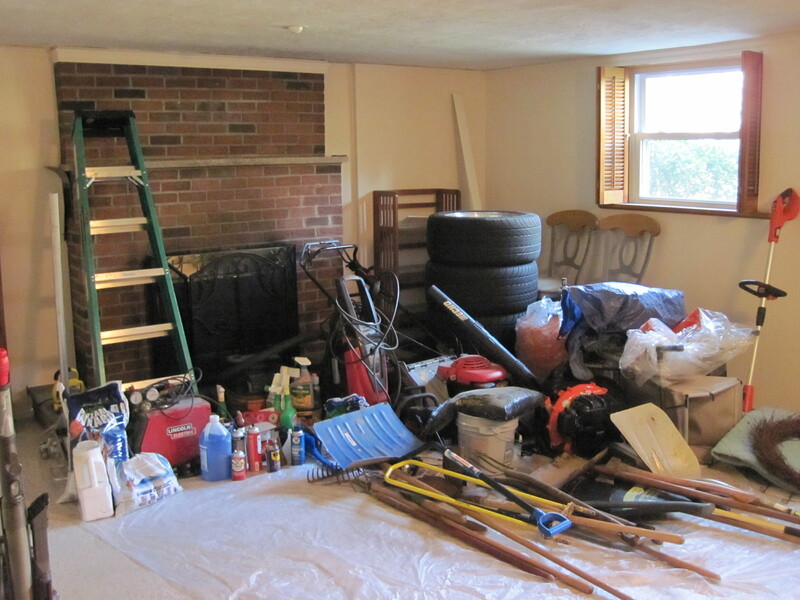 We will need the room to hold a lot of stuff (toys, clothes, and gear) and we need it to accomplish that task smoothly. Next we asked what types of things aren’t working for us in that room. As we said, we need to accomplish as much as possible before Littler K is born. It’s a tight fit but it looks like we’ll be able to get all the necessary furniture in there – and maybe a few fun extras! We have Kasen’s bureau and changing table under a window and it helps to keep him distracted during diaper changes – we’ll do the same for Littler K. The big wall will be perfect for the crib. 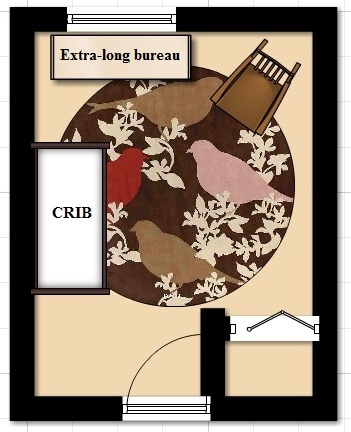 We’ll put a nice plush baby-friendly rug down to give the baby a soft surface to crawl/fall on. The color pallette is not likely to be the same color pallete we pick for the bedroom -it was entirely random for the floor planning software. We want to make some more progress on our Someday Patio before diving into Littler K’s bedroom, but we’ll consider this plan a good start! Are we really this dirty? After two years of living in our home, the carpet looked terrible. Stains everywhere! The poor carpet had held up to Gigi’s sensitive stomach, Kasen”s infant reflux, and our backyard mud pit (the someday patio), but it was showing some wear to say the least. Kristin was convinced that we would have to live with it until we could afford to replace it. 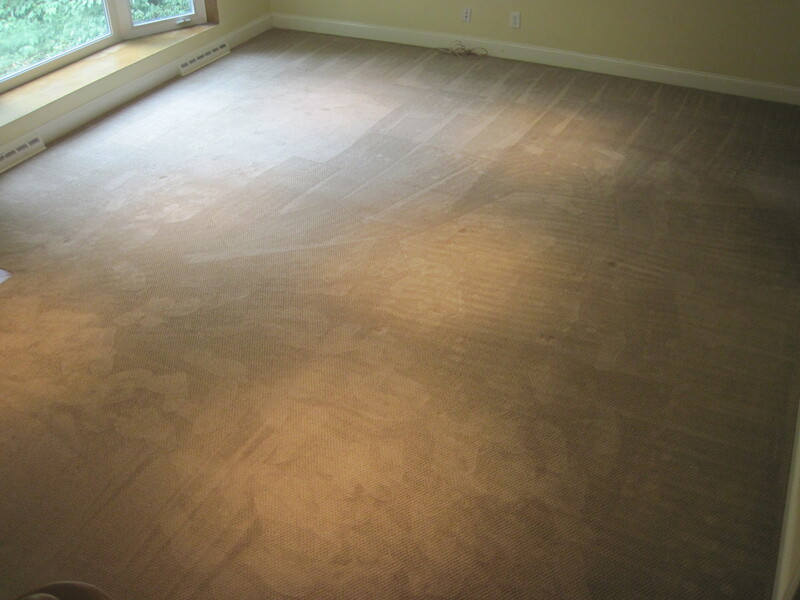 Krister suggested we have the carpet professionally cleaned before we replaced the whole thing. Kristin was still skeptical but agreed to give it a go! 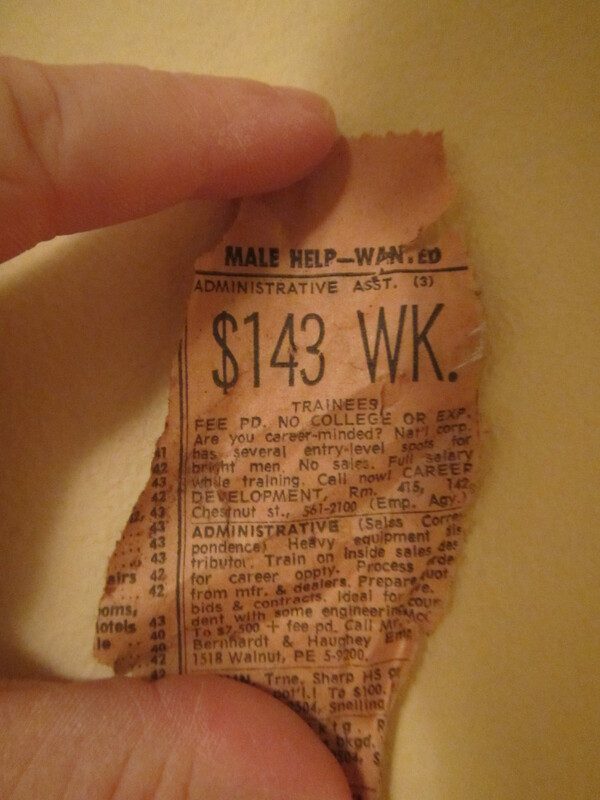 We made an appointment with Stanley Steemer. 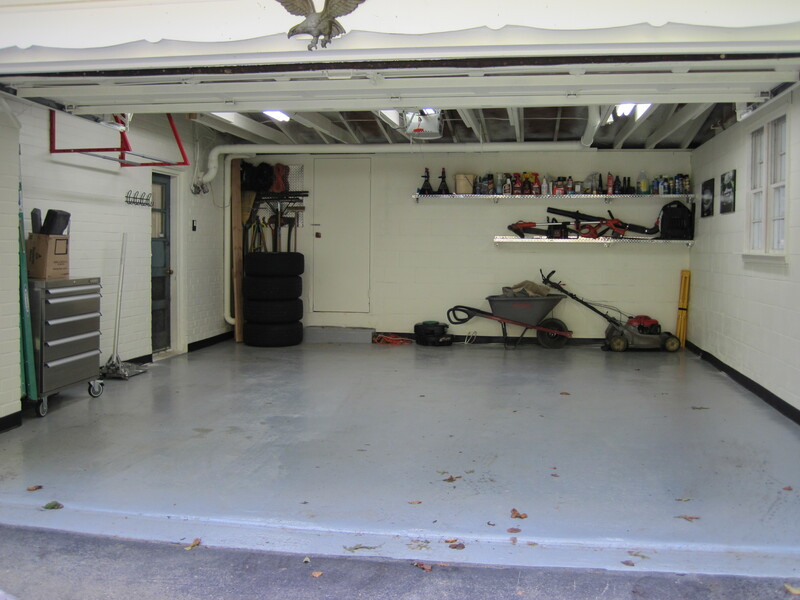 (We don’t get any swag for mentioning our experience with Stanley Steemer – we just want to share our experience.) Our expectations were low, but we were pleased by how easy it was to get an appointment. We found some coupon codes online to keep the price reasonable. We had the living rooom and stairs cleaned and protected. When the team came out to do the work, they tried to add on some deoderizing treatment (some of our pet visitors had accidents on the carpet and the team thought it would smell after cleaning). We declined, figuring that spraying some Febreze over the carpet would do the job just fine. We moved all the furniture out of the room so they could clean every inch. The team showed up in the middle of the arrival window. We watched them clean (we’re so curious!). It was really iimpressive. We could literally see the stains disappear before our eyes. 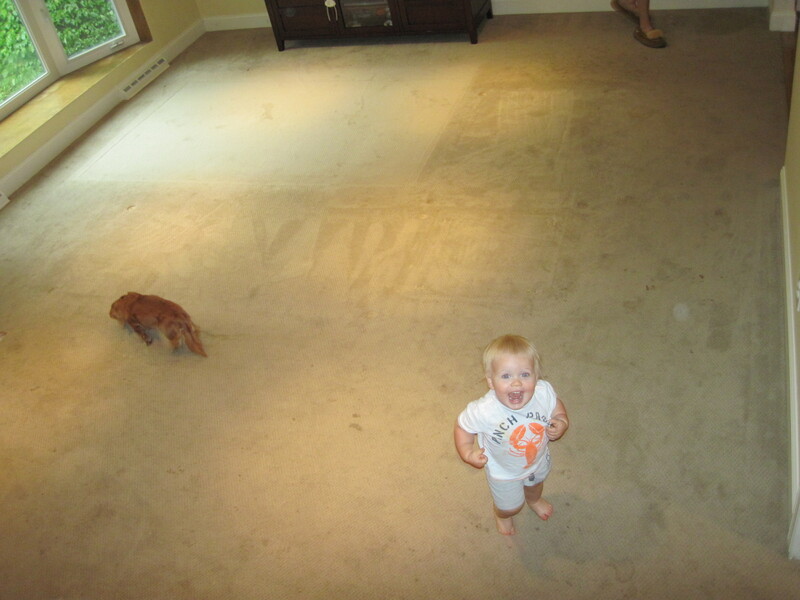 We weren’t allowed to move the furniture back on the carpet for 24 hours while it dried. We really couldn’t believe how much we use the living room; we had such a hard time living upstairs. Fortunately, we’re TV lovers so we had something to do! 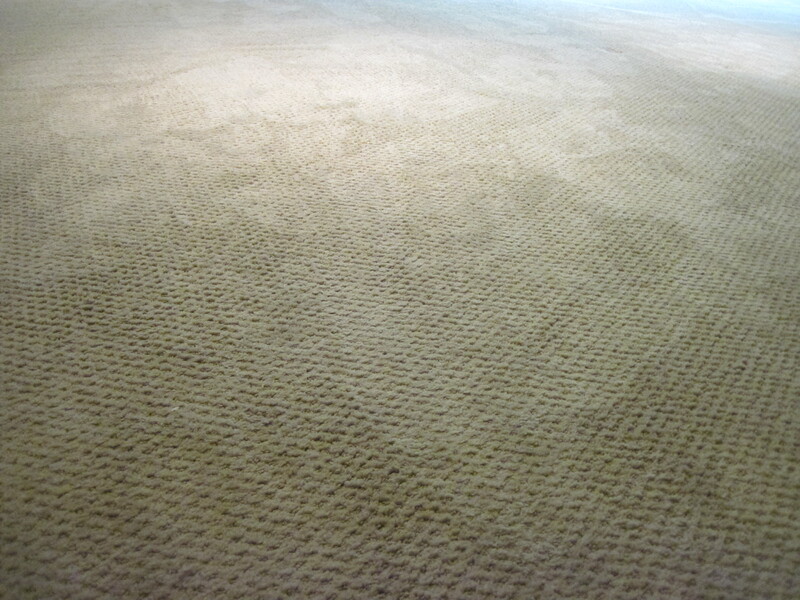 Our rug looked as good as new afterwards – and it was so much cheaper than ditching the carpet and starting from scratch. We’re glad we skipped the deoderizing treatment. We did spray the carpet down with Febreze after the team left, but we don’t think that was really even necessary. 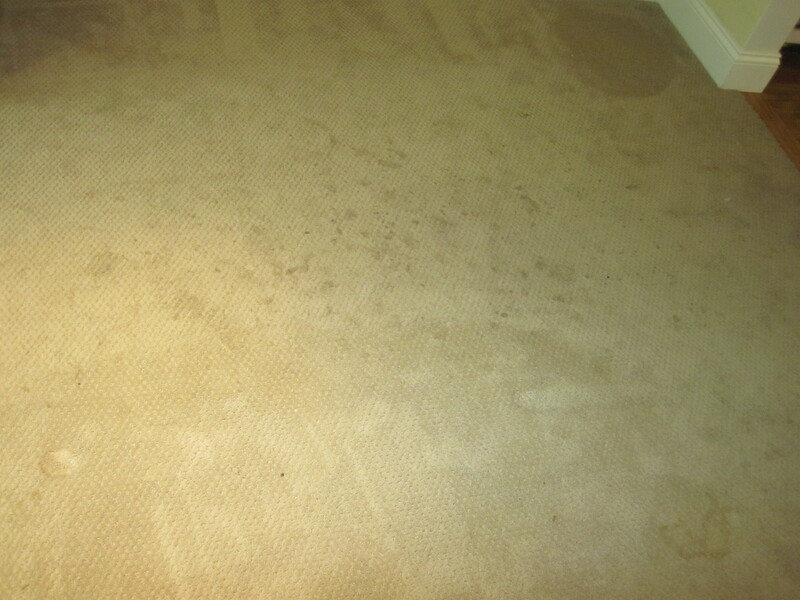 The rug had a slight musty smell for a couple hours after the treatment, but it disappeared. All we’re left with is a mighty clean carpet. We’re down to the far end, only 10-15 feet from the wall we will connect it to! 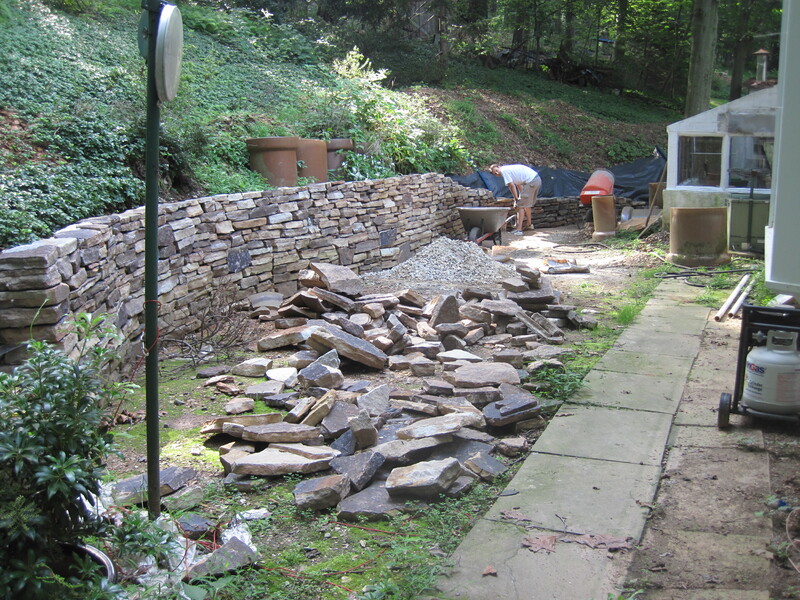 Of course, then we have to lay the flagstone (and throw a PARTY!). We’ll update you more as it grows (like Kristin’s belly is! ).